Imagine spending a few days with your partner in a city, where you can have a candlelight dinner on a terrace, drink the best wine in the world, walk along historic streets and buildings, and admire paintings, sculptures and art. Imagine that during those few days you are staying in a 16th-century building and are surrounded by satin, Italian wooden furniture, marble floors and crystal chandeliers. If this sounds like your ideal holiday, then Florence is the place for you. Only here you can have all that and more. No one does romance better than Italians and you can experience that in Florence. If you would like to know what kind of accommodation the city offers, have a look at the hotels below and decide if coming to Florence will make your dream romantic holiday come true. The Borghese Palace is located in a wing of a neo-classical palazzo, not far from the Uffizi Gallery. The hotel mixes old charm with modern elements. Each room is elegantly decorated with some contemporary artworks. The views from Santa Maria Novella offers exclusive glances of the Santa Maria Novella Cathedral. The hotel faces the beautiful piazza of the same name. The building has been recently restored and refurbished with luxurious textiles, antiques and lacquered boiseries. This hotel has been designed to amaze its guests with extraordinary features. The rooms are painted mostly in black and fuchsia colours, which gives the rooms a sleek look. The hotel’s restaurant serves breakfast daily and makes sure that visitors with allergies, or gluten intolerance, are catered for as well. Ville sull'Arno is an ideal place for a romantic break. Each room has been tastefully decorated in the style of Macchiaioli painters, Florentine art movement and to relax and unwind. The hotel organises weddings and anniversary celebrations. If you stay here you will have the privilege of sleeping in the oldest hotel in Italy. The building has preserved most of its 13-th century charm, including a tower and frescos in some of the rooms. It is filled with antique furniture and the rooms mix old charm with modern furniture in white and red colours. The building in which the J and J House is located has once been a convent, but don’t let that discourage you. It might have stayed true to its past but it is decorated with modern furniture and finished with beautiful materials to provide comfort and ambience of relaxation. This hotel is cozy and charming with very friendly staff, who always try to satisfy the most demanding guests. This modern and elegant hotel is located only 15 minutes from the Duomo and Accademia, and the romantic Ponte Vecchio. It is also very close to the Chianti hills, famous for their scenery, wine and culinary traditions. The hotel’s staff can organise romantic trips for you and your loved one. At Montebello Splendid you will experience the attention of a ‘boutique hotel’ with a 5-star service. The rooms are all soundproof and are equipped with king-size or double beds covered with satin sheets, mini bars and free tea and coffee makers. The luxurious bathrooms are finished with marble to add a little more sophistication. The location provides maximum privacy, but it only takes 10 minutes to reach the major attractions. The St Regis Florence offers unique experiences. Here you can witness ‘champagne sabering’ - one of the most theatrical and exclusive ways to serve champagne - enjoy its famous butler service, and drink the famous Bloody Mary, which was invented in St Regis in 1934. All of these can add more charm to your special romantic break in Florence. 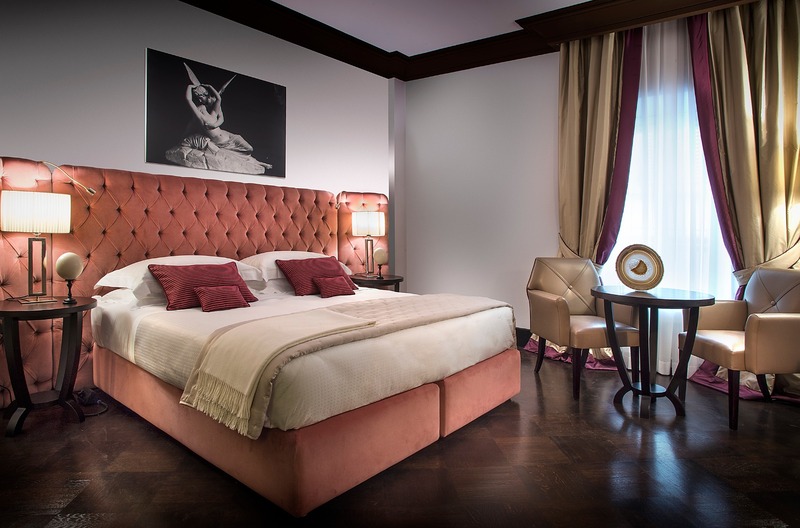 The 193 rooms at the Grand Hotel Baglioni have been renovated and are now comfortable and elegant, and provide extraordinary views of the city. The lights and the hand-crafted wooden furniture bring warmth and coziness to each of the rooms and suites. The hotel is located in the heart of Florence, just steps away from the Duomo Cathedral. The hotel is located in a historical tower, which has been beautifully restored to accommodate luxurious rooms and suites. The Romantic Room enjoys views of the Arno and Palazzo Feroni Spini and offers en-suite bathroom with a jacuzzi. The hotel also organises different activities. Why not do something different and attend a cooking class with your partner, or attend a guided tour to one of the wineries? Balestri was renovated and turned into a charming boutique hotel in 2015. The rooms were restyled with great attention to detail and are now comfortable and elegant. The furniture is stylish, but simple, providing a minimalist style to the hotel. You can enjoy views of the Arno, Ponte Vecchio, and the hills of San Leonardo and San Miniato. This cozy hotel has 25 stylishly decorated rooms and is located very near the Santa Maria Novella train station from which you can also take a bus to the Belmond Villa St. Michele. There you can dine in a restaurant with sweeping views of Florence below. If the weather is good, you can enjoy your meal in the outside garden. All rooms at this 4-star hotel are decorated in a unique Florentine style with wooden furniture, glass chandeliers, beautiful window drapes and comfortable king-size beds. The staff at the Strozzi Palace can organise personalised shopping tours and trips to romantic places such as Chianti hills, or Monte Carlo. Enjoy the panoramic terrace on the rooftop with breathtaking views, where you can have your lunch or dinner. The wine bar, which is also located on the rooftop, serves a great selection of Italian wines, which will be a great addition to your romantic dinner. All of the rooms have been renovated to make them even more comfortable and functional. All 98 rooms in this stylishly designed hotel have been decorated with elegance. They bring back the old-fashioned ambience with some modern twists. The traditional Tuscan cuisine is served at the hotel’s restaurant. You can also dine at one of many nearby restaurants. Explore the small streets, where you will find small, cozy restaurants and bars, where you can have a romantic meal. At the Embassy, comfort and elegance are combined with modern and technological facilities. Ecological materials were used to make this hotel special and stand out from the others. The Embassy offers honeymoon packages with an upgrade to its superior double room. La Signoria offers honeymoon packages, which include a 3-night stay, a bottle of champagne and other services. The hotel enjoys a great location - in the heart of Florence, but in a quiet street to provide guests with a restful and romantic holiday. Spend your ideal romantic break at the Firenze Number Nine. Each of the nine rooms in this hotel has a different design and offers different services. Book the Romantic Getaway package and receive an aperitif with a view of the sunset in a secret and romantic location, a welcome drink at your arrival, and breakfast delivered to your room. Roma Hotel is a newly renovated, 4-star accommodation in the heart of Florence. Its doors lead directly onto the Santa Maria Novella Piazza and the decor inside was inspired by the Santa Maria Novella Cathedral. It is a perfect location for romantic evening walks and dinners. At this elegant 5-star hotel you can enjoy a buffet breakfast, a drink in the beautiful surroundings of the hotel’s stylish lounge and luxurious rooms, decorated with fine Italian materials. The Arno river is just nearby and walking along its banks is one of the most romantic experiences you can have in Florence. Residence Hilda has 12 modern apartments, situated very near the Duomo Cathedral. The rooms come with a kitchen, but if you prefer not to cook, you can have a candlelight dinner with your partner in one of many restaurants nearby. The rooms here are fit for a king. All of them have special, historical features, such as frescos, marble floors and antique furniture. The hotel has a rooftop terrace, where you can have dinner while admiring the views of the city. This is one of the most luxurious hotels in Florence. Located in the Old Town, it puts you right in the centre of things. One of the attractions that the hotel offers is a culinary tour around Florence, which was put together by celebrity chef Fulvio Pierangelini. This hotel has rooms suitable for young couples visiting Florence for a couple of days. They are comfortable and functional and offer their guests as much privacy as possible. The hotel has a lovely terrace, where you can have a meal and admire the views of the city. The nearby Market of San Lorenzo is an ideal place for a romantic stroll. What better place to stay in Florence as a couple than a hotel with ‘amore’ in its name? This hotel has been created to bring their guests privacy and luxury. Everything here screams 'romance’, from marble bathrooms to Italian furniture. The Romantic Superior Room, which has amazing views of the Duomo, comes with a personalised breakfast. Palazzo Gamba offers luxury apartments of different sizes. Each of them comes with Italian furniture and is decorated with the best materials. Some of the apartments have terraces and balconies with great views over the nearby streets. This is a brand new hotel, offering unique design rooms, amazing views of the Cathedral of Santa Maria del Fiore and a hidden inner garden, which can be enjoyed at any time of day or night. The hotel also has an outdoor hydromassage pool, where you can relax and have an aperitif, prepared by the hotel’s bar. Florence wears its heart on its sleeve. It is an ideal place for any couple, looking for a romantic getaway, as well as immersing themselves in some culture and art. There is no other such place in the world. Spend your days eating gelato, or pizza, have a dinner over the Arno River, climb one of the hills and admire the city from afar, go on a wine tour and stay in one of the historic and luxurious hotels. You will create some beautiful memories here and you will come back even more in love than before. Book one of the rooms in Florence and create your perfect romantic break.